- 50M is invested back in, then 25, etc. - Reduction in gov. Spending has multiplied reduction on A. Chapter 12: fiscal policy, deficits, and national debt. 12. 1 aggregate demand policies for stabilizing business cycles. Fiscal policy: changes governments make to purchases, transfers, and taxes to achieve macroeconomic goals. Injection: spending in the circular flow that does not start with consumers. Net taxes = taxes received minus transfer payments. Leakage: spending that leaves the circular flow through taxes, savings, Example: government spends m on new bridge. Increased income for bridge business, which leaks to government as tax. Some of income is saved, another leakage. Some of money is spent on imports, another leakage. Assume 50% of the 100m is leaked, and 50% is spent in canada. 50m is invested back in, then 25, etc. 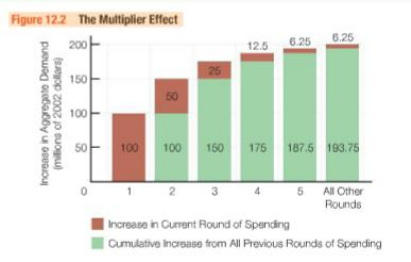 Multiplier effect: a spending injection has a multiplied effect on aggregate demand. Size of multiplier effect = 1 / % of leakages from additional income. Estimated to be around 2 for gov. A tax cut or an increase in transfer payments reduces leakages.